Clean vehicles: S.B. 1204, Ricardo Lara (D-Huntington Park/Long Beach) and Fran Pavley (D-Agoura Hills), which passed the Senate Committee on Environmental Quality on a 6-1 vote, was read for the first time in the Senate Appropriations Committee. The bill creates the California Clean Truck, Bus, and Off-Road Vehicles and Equipment Program to fund development, demonstration, and deployment of zero- and near-zero-emission medium- and heavy-duty vehicles. 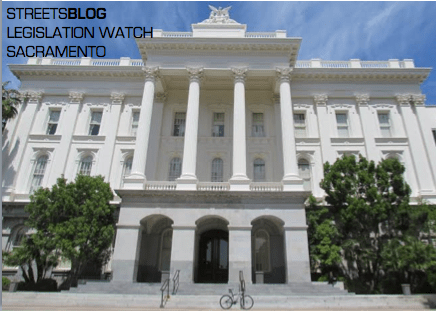 Funding for the program, which would be run by the California Air Resourced Board (CARB), would come from the cap-and-trade system set up under the 2006 Global Warming Solutions Act, A.B. 32. Greenhouse gas emissions into the future: S.B. 1125, also from Fran Pavley, was amended slightly and passed by the Committee on Environmental Quality, and now goes to Appropriations. The bill amends Pavley’s A.B. 32 by requiring CARB to develop overall targets for 2030 emissions reductions, beyond the 2020 reductions targets currently required by the law. Texting while driving: A.B. 1646, from Jim Frazier (D-Oakley) and Mike Gatto (D-Los Angeles), passed the Appropriations Committee on a 16-1 vote. It was read on the Assembly floor once and ordered to a second reading at some point in the next few weeks. This bill increases the penalties for using a phone or texting while driving, increasing fines and assessing a point against a driver’s record for a 2nd or subsequent violation. It also requires the DMV to include questions about the distractions and dangers of cell phone use and texting while driving in the exam for a driver’s license. With cell phone use now the leading cause of “driver distraction” crashes in California according to the Office of Traffic Safety, this bill is a start in the right direction, despite those who wrongheadedly assert that if “everybody does it” it must not be so bad. For social media coverage focused on state-wide issues, follow Melanie @currymel on Twitter or like our Facebook page.